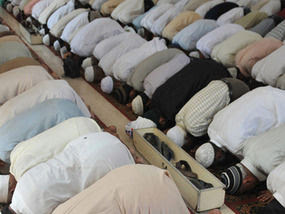 ISLAM FLOURISHES IN UK: LIFE COULDN’T BE BETTER AS MUSLIM TOTAL HITS 2.4 MILL…….! – The Tundra Tabloids……. ISLAM FLOURISHES IN UK: LIFE COULDN’T BE BETTER AS MUSLIM TOTAL HITS 2.4 MILL…….! BRITAIN’S Muslim population has hit 2.4million because the UK is seen as the best country in Europe for the Islamic faith, a report is to reveal. There are 1.1million Muslim immigrants and 1.3million UK-born Muslims – mostly the ­children of newcomers. Muslims quizzed said there was less open hostility to Islam in Britain than other EU countries and that the Government is ­sympathetic to them. But critics seized on the f­indings as confirmation that Labour’s multicultural policies are pandering to Islam. Sir Andrew Green, of the ­pressure group Migrationwatch, warned the Muslim ­population in Britain was likely to be even higher than research showed. Muslim illegal immigrants were unlikely to respond to Government-linked surveys, he added. The population research is to be published next month in a new “faith map” of the UK drawn up by the Institute for Public Policy Research, a think-tank with close links to 10 Downing Street. Even the authors admit the increasing numbers of immigrants of different religions will be “challenging” for social cohesion in the UK. The report found in the past decade a rise of 275,000 in the number of Muslims who were born in Pakistan or Bangladesh living in Britain. The increase is equivalent to twice the population of Oxford. And the number of Somali-born UK residents had also risen sharply – from fewer than 40,000 in 1999 to 106,700 this year. Previous Post Previous Post VIDEO OF COUNTERJIHAD ACTIVIST ELISABETH SABADITSCH-WOLFFE LECTURING IN HER SEMINAR ON ISLAM……. Next Post Next Post SCEPTICAL SCIENTIST’S HEART ATTACK ON LIVE TV WAS FALSE ALARM…….